Travelling overland from Chiang Mai to Vientiane is an easy and cheap way to get from Thailand to Laos. It is a very popular way of doing visa and border runs for many backpackers and expats, who want to stay in the Land of Smiles a bit longer. Ticket prices are reasonable – for only 750 Baht you can find yourself in a different country in a matter of hours. Recently I’ve travelled to Vientiane from Chiang Mai this way. I got to the capital of Laos a little bit tired, but for me, it was an adventure and a reminder of just how much I love travelling. Here is how you can travel overland from Chiang Mai to Vientiane in an easy and cheap way. Your adventure will start here – at the bus station in Chiang Mai. There are no direct buses to Vientiane from Chiang Mai. The last stop is in Nong Khai, a small town near the border with Laos. The whole trip takes around 12 hours. Most of the busses drive overnight and get to the final destination in the morning. Traveling during the night is less strenuous and the trip doesn’t drag as much. Just make yourself comfortable and sleep through it. 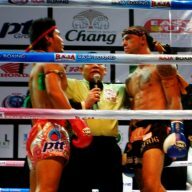 I bought my tickets to Nong Khai online from 12Go Asia. They were cheaper than those offered at the hostels in Chiang Mai. I then had to collect the tickets from a tourist office by the station on the day of my departure. It was very fast and straightforward. 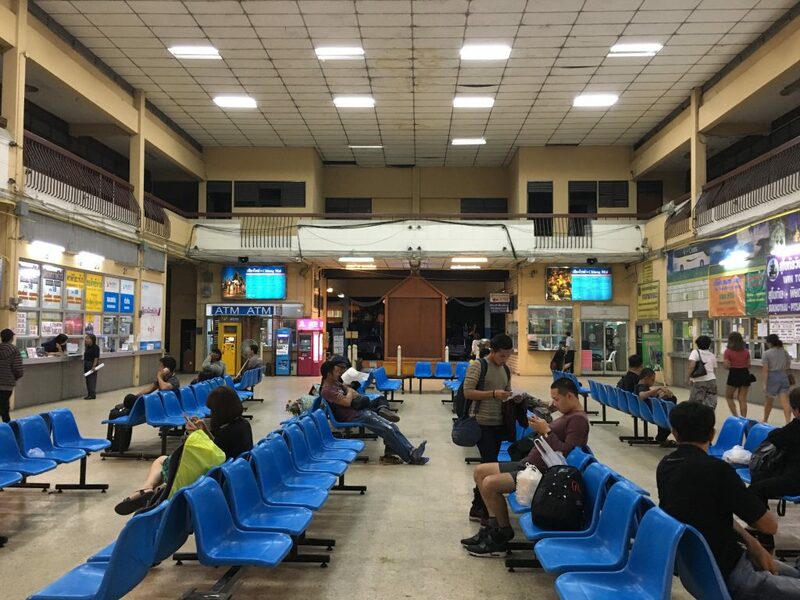 I have been using 12Go Asia ever since, but if you don’t trust the Internet, then you can buy your ticket directly at the bus station in Chiang Mai. Songthaew from the city centre costs around 30 Baht per person. Go there a few days before and purchase your tickets at one of the counters. One ticket costs 700-800 Baht. 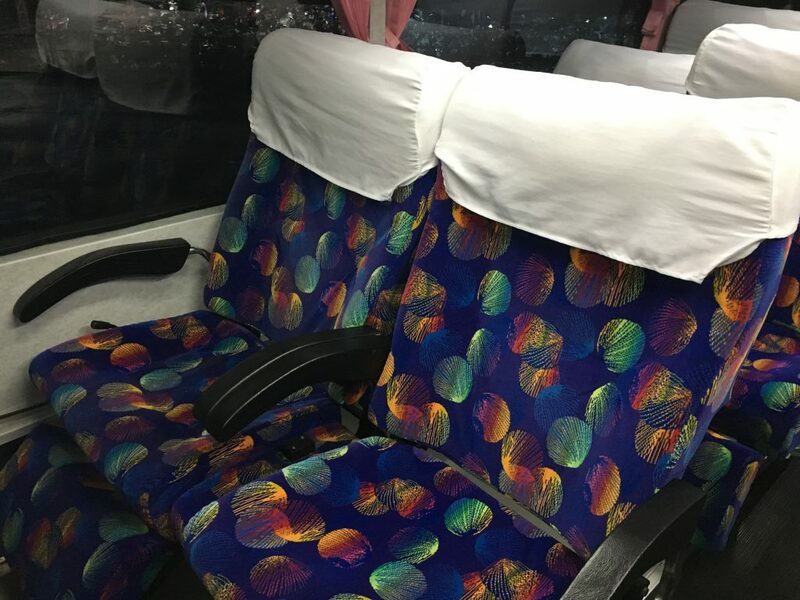 Buses are equipped with air-conditioning and have big, comfortable seats, which you can spread to nearly a laying position. You also get a blanket, a bottle of water and a meal, consisting of rice, meat or an omelet – it might not be the most luxurious meal ever, but it is fulfilling and gets you through the night. If you think that you might be hungry later, then take some snacks with you. Thai drivers are famous for putting air-conditioning up and turning their vehicles into moving freezers, so take a jumper with you and wear long pants. These seats might not be stylish, but they are pretty comfortable. There are no longer stops on the way. The bus stops in bigger towns for gas and to pick up passengers. Toilets are on board but, for obvious reasons, it’s better to use them during those short stops. As soon as you get off in Nong Khai, you will be approached by one of the local tuk-tuk drivers, who will offer you a ride. 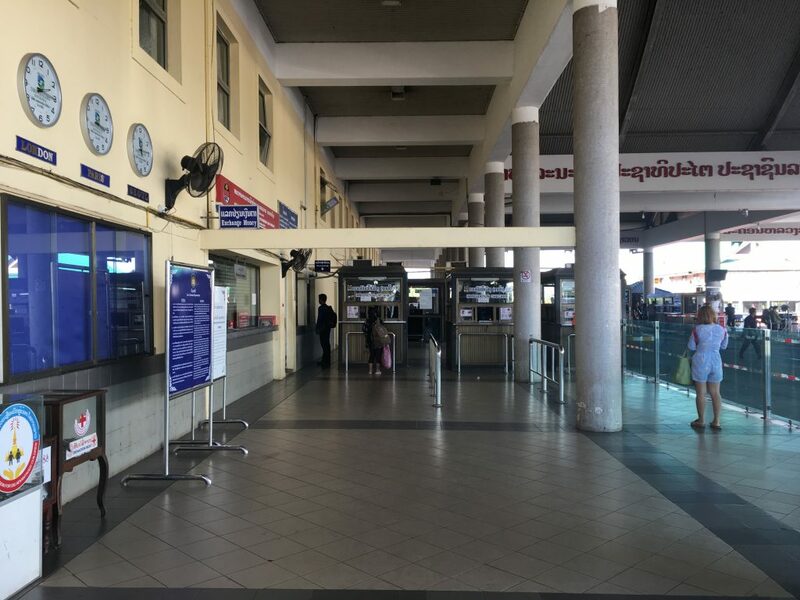 Before I left for the trip I had checked forums and different travel sites to find out how much it should cost to get from the station in Nong Khai to the border and I’d found different opinions. On my way back from Laos I was picked up by a driver, who had a whole list of prices pinned to the back of his seat. 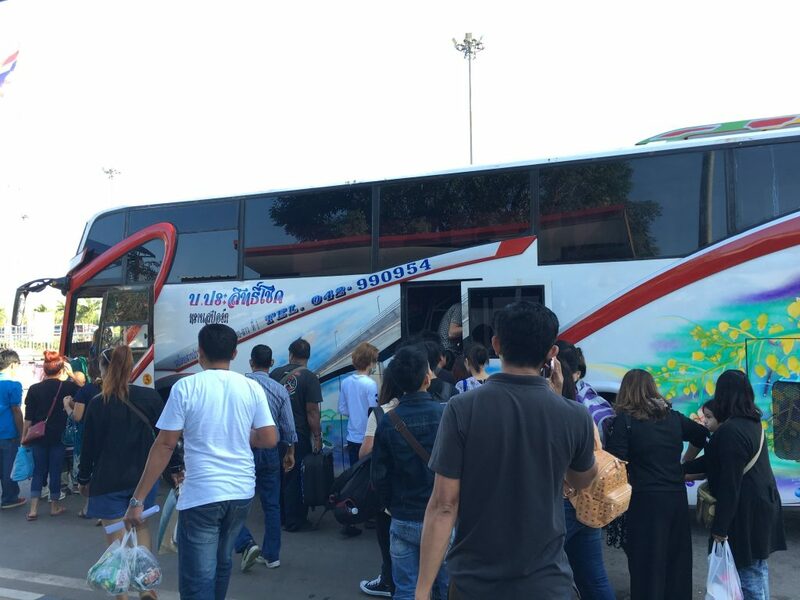 As it turned out, a ride from the bus station to the border should cost 50 Baht per person. I paid 80. As any overland crossing in Asia, this one is also chaotic and might be crowded. 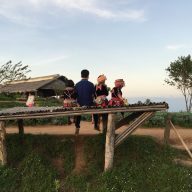 A few years ago, during my first visit, I stood with my huge backpack in 40 degrees heat and thought that getting the visa to Laos was an impossible task. This time it wasn’t that bad. Maybe because there were no crowds. Getting through the immigration on the Thai side is not difficult. You just give the officer your passport, they give you another stamp and you’re ready to go. Remember about filling out your departure card beforehand. It’s the white and blue piece of paper you get when you arrive in Thailand. If you don’t have it, don’t worry. You can get a new one at the immigration stand. The departure card is easy to fill out. You only need to give your personal information, such as name, surname and a passport number. In case of crossing the border overland, you don’t need to give details of your vehicle. After you get your passport back, you need to take a bus over the Friendship Bridge. It is a short ride, but busses are usually overcrowded. If you travel with a big backpack it’s better to put it in the luggage compartment. Tickets cost 20 Baht per person. Buses here are really crowded. You also need to get your arrival/departure card from one of the windows (it’s either window number 1 or 2, depending on which officer is willing to open it for you). Fill out everything carefully and, along with the money, give it to an officer in the window number 2. Now all you need is to wait at the window number 3. 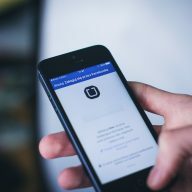 Everything takes approximately 10-20 minutes, depending on how many people are applying. The border crossing in the early morning is pretty deserted. Laotian taxi drivers always hover around the immigration desks. To appear more friendly and helpful, they help people filling out their application forms. At the end, they offer them a ride to Vientiane. You can refuse and then look for a driver after you cross the border, or you can negotiate the price. A standard price to get to the city is 250 Baht. 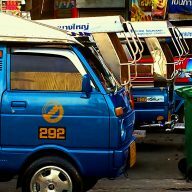 Drivers accept Laotian Kip and Thai Baht. 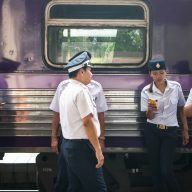 Traveling overland from Chiang Mai to Vientiane might not be the quickest way of getting to the capital of Laos. For some 12-hour journey might be too tiring. However, a one-way ticket is quite cheap, comparing to flight prices and those, wanting to save won’t be disappointed. There are no direct flights from Chiang Mai to Vientiane. A flight with a stopover in Bangkok costs as much as $200 and the whole trip can take up anything from 8 to 20 hours. You can book a flight through one of my favorite flight search sites – Momondo. A cheaper option is a flight from Chiang Mai to Udon Thani. The only airline that operates on that route is Nok Air. Flights cost around $20. You won’t find Nok Air flights on Momondo and other similar sites. You can book your ticket directly on Nok Air’s site, or use 12Go.Asia. From Udon Thani you need to take a mini van to the border. It takes around 2 hours. 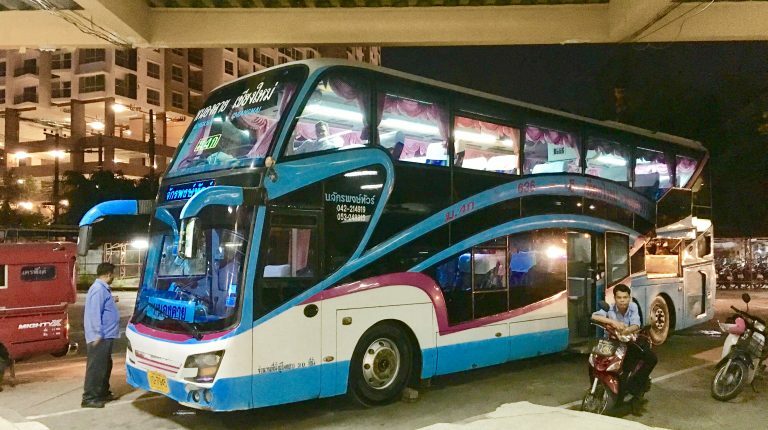 You can also take a 3-day cruise from Chiang Mai to Luang Prabang and from there take a bus, but this is a very long, tiring journey and recommended only to people, who have a lot of time on their hands.